Spring and pollen are in the air at the College. Our campus is bursting with green grass, beautiful flowers and plants, and a vibrancy from our students, which is often brought about by the warm weather and the proximity to the end of the academic year. This also is the time of the year when elections are held for our Student Government Association (SGA) and Graduate Student Association (GSA). For me, this is particularly nostalgic time of the academic year. Forty-eight years ago, I was elected as president of the Student Government Association at the College. That moment marked the beginning of my lifetime of public service. I was a little anxious to become president and, at the same time, extremely eager to serve my fellow students. I assumed this leadership role at a unique time of the College’s history. A year prior, in 1967, the College had admitted its first African-American student; around the same time, the College was working toward becoming a state institution, which happened in 1970. I knew that to accomplish anything that would enhance the student experience, it would take everyone working together. It also would take a leader of principle and follow-through. One of our nation’s founding fathers, Thomas Jefferson, once said, “God grant that men of principle shall be our principal men.” To me, Jefferson speaks to the most important character a good leader should possess, and that’s integrity – to be honest in your dealings with others, to keep your promises, to be fair – no matter the circumstances or the consequences. It was my integrity that allowed my fellow students and President Ted Stern to trust me, which helped us all to develop a stronger and better College of Charleston. Being involved in student government helped me forge lifelong friendships and instilled in me many great skills that have been vital to the various roles I’ve had – as state senator, as chairman of the Senate Judiciary Committee, as president pro tempore, as lieutenant governor, and now as president of the College of Charleston. Further, being SGA president opened up many doors in my life. The connections I made with faculty, staff, administrators, and community members informed how I thought and how I led. Serving on that body added great value to my life and helped forge an even deeper connection between me and these hallowed campus grounds. I want to thank the SGA and GSA for their service on behalf of our student body. These student organizations have shown exceptional interest in bettering our campus, our local community and our world. You are the people that will shape the future, and we – the entire College of Charleston community – are so appreciative of your efforts. I also want to extend my congratulations to the newly elected members of both organizations. I wish you all the best as you work to serve our students and our College. 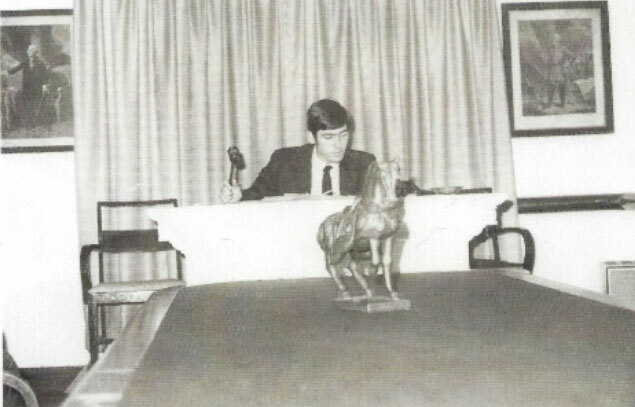 President Glenn McConnell, c. 1969 as a senior and student body president, with a bronze horse that stood as the emblem of the Student Government Association (and has since cantered off to unknown pastures). You can read about my address to the SGA in March on The College Today.